One convenience of traveling to the same locale over time is consistency. San Diego seems to transform with each visit, though in essence change is more superficial, more cosmetic, than truly trans-formative. My comment may seem insulting and I don’t mean to convey any message San Diego is a hopeless mess. Quite the contrary, San Diego has gotten many things right. The guy I overheard at San Diego International Airport may disagree; he said San Diego was the worst managed city of any in his experience. I have no idea who this guy is but I don’t think his breadth of experience is vast. I wonder if his experience would fill space on fortune cookie-sized paper. In any event, San Diego is a consistent and dependable destination. San Diego changes cosmetically, the ebb and flow of business success, failure, and economic development. Restaurants open their doors, and shut doors months later, as do bars, clubs, quaint little foodie places serving peculiar dishes. Some structure is has always been in the midst of being built when during a visit. 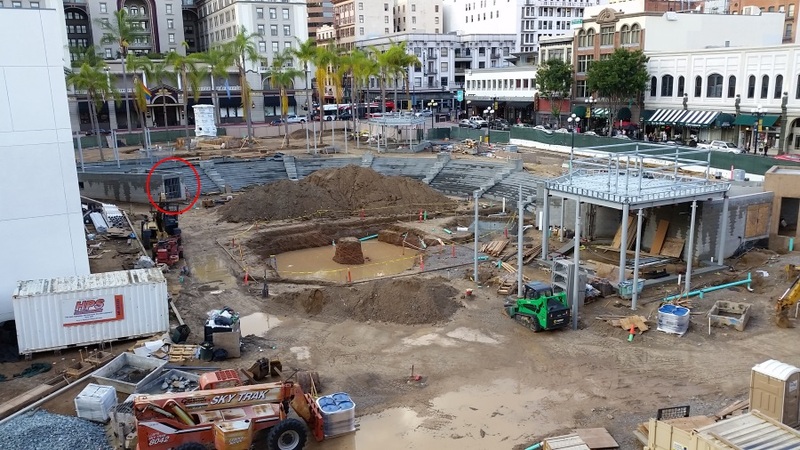 Just outside Horton Plaza an amphitheater is getting dug out. I’m guessing the large pit with partially completed coliseum-style seating is an outdoor amphitheater; however, there is a gate on one side suspiciously similar to gates opened to allow the lions at the Christians, or some angry creature at Padawan Jedis. Nearby, a condominium is going up, but contractors have barely installed the plywood safety wall to prevent inattentive passersby from getting their skulls caved in or falling into the Sarlaac Pit that will have to be relocated. Sarlaacs are on the “threatened species” list, by the way. I saw that go by on Twitter the other day. What San Diego has gotten right, or at least taken more than a half-hearted stab at, is multi-modal transportation. Stand at the pedestrian crossing outside the San Diego Convention Center and count the different modes moving people around. People walk. Bicyclists garbed in their safety gear ride by at near-traffic speeds in their own bike lane. SMART cars and other hybrids comprise a good part of vehicular traffic. Of course, we have numerous motorcycles of all makes and models. Waiting for the walk signal may allow a glimpse of both the Gaslamp trolley. The trolley is not limited to the Gaslamp, though, reaching as far north as Santee, and curling south to San Ysidro, near Tijuana, Mexico. The Amtrak Sante Fe Depot offers connections to people who need to get further away, especially north via the Pacific Surfliner. And, then there is the San Diego Metro Bus. The bus is great. For $2.25 a person can ride the bus to/from San Diego International Airport. Don’t pay for a taxi; no need to wait on a shuttle from the hotel. Just wait about 10 minutes for Bus 992 to roll up, slide two bills and a quarter into the machine, and take the easy ride downtown. Great, cheap secret to getting from the airport to any hotel in the Gaslamp District and environs. A person can walk from the San Diego International Airport to downtown. Is there another airport a person can literally walk to, the criteria being the person must travel from a historic district or some other tourist destination, along paved sidewalks and other public amenities? I don’t know of any, but my experience with airports is only slightly more than two hands worth of fingers. Gatwick, outside London, requires a train-ride into London, which is nice, but not really the same as walking. London is a massively walk-able city, though. My point, hidden among all of my hyperbole, is San Diego is consistent. Ralph’s is right where I left it. Residents and long-stay guests play nice (mostly), and are very casual and cool. The Field is right where it belongs, near 5th and Market, and still have a decent Shepherd’s Pie, though what in the hell is with the messed up Guinness pours? The hell… A Guinness pour means to fill the glass 2/3rds and allow the foam to settle. Then, finish the pour. A person wanting a Guinness needs to expect a wait. While your company is already quaffing their Miller Lite, perhaps half gone, you will be receiving your first Guinness. That is how the process works. A Guinness pour should never have foam and froth swirling around. Getting a Guinness with a miasma of foam and froth dancing around inside the glass is evidence of a bad pour, and an ignorant bartender. Am I wrong? The premise of my blog is for me to have a forum to post thoughts, notions, ideas, and other forms of content related to helping people understand this very simple yet tremendously subtle idea: geography is everywhere. “Oh, I agree. But, this morning I am drinking the ESRI Kool-Aid. Jack Dangermond addressed the crowd of, oh, probably 16,000 people and spoke to us in his humble but subtly evangelical tone about how great geospatial technology is, how much progress people are making, and how flesh-and-blood people are making real and significant changes in lives of hundreds, if not thousands, if not hundreds of thousands of people. I’m not exaggerating about 100,000s of people. The 2014 earthquake in Nepal and the Ebola epidemic in western Africa certainly affected 100,000s of people, continue to do so, and in the case of Ebola, 1,000,000s of people could be impacted. So, I do not exaggerate. GIS is a remarkable tool and ESRI does good work to support humanitarian efforts, of that there is zero doubt, and is a privately held corporation. ESRI is publicly traded nor may ever issue publicly traded stocks. Forrest C. Lamb, Marine Reservist and Geomentor. Following Jack D. was a host of both public and private sector GIS disciples showcasing their work in a variety of endeavors. Major advances have been made in fighting and managing wildfires globally, thanks in part to advances in GIS and geospatial technology. Foresters from the province of Victoria, Australia presented their fire management efforts. The vast majority of Australia is affected by wildfires and the southern portion around Melbourne is not exempt from experiencing a wildfire. The southern portion of Australia is a confusing mishmash of toponyms; if I were to mention Victoria, British Columbia, and Vancouver Island all in the same breath any given person might think Canada. Add in Craigdorrach Castle and someone might get really confused. But, all of these places are found near Melbourne, Australia. 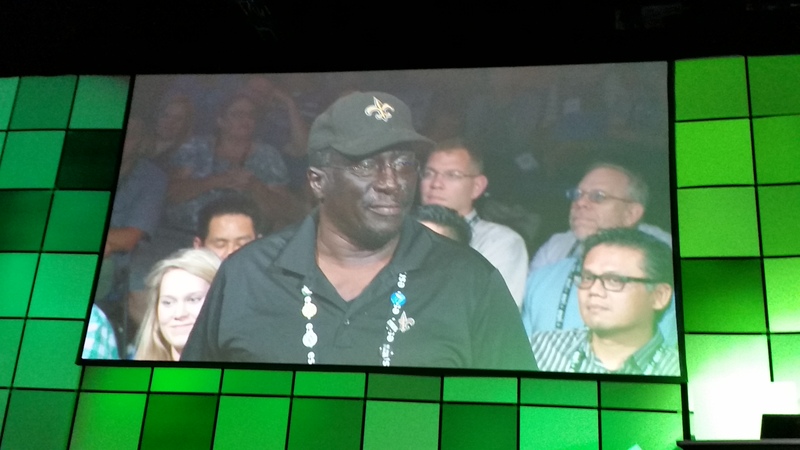 A parade of ESRI folks enchanted us with new and improved features and functionality, while other ESRI presenters beguiled us with brand new app offerings, too new to have bug fixes or improvements. ESRI’s ArcGIS EARTH is one such offering, a partnership between Google and ESRI, to evolve Google Earth beyond a simple 3D viewer. Several cool apps were introduced, like “ArcDrone AppStudio for Organizations Server Edition,” a build-your-own-organization-specific drone app managed through ArcGIS Online. No – I made this up. Sometimes, the geek is strong in this one and creating parody applications is too easy. Sounds good, though, huh? These people appreciate ESRI. 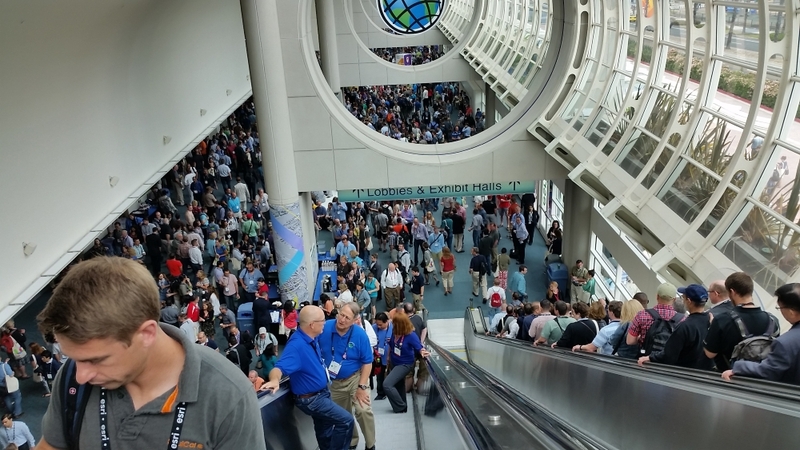 Not sure why people who don’t like ESRI attend the ESRI UC. Like going to Comic-Con and hating comic books, comic books, and cosplay. There are a good many ESRI haters in the GIS community. Not sure why. I mean, understand their complaints. I’ve been in this industry since 1991. I’ve worked with people who worked in the private and public sector and now work for ESRI. I know some of the cultural mindset inside ESRI. I don’t want to sound like I am defending ESRI but these people need to understand one thing: GRASS, ELAS, and a host of other GIS software had their opportunity to flourish. They didn’t. 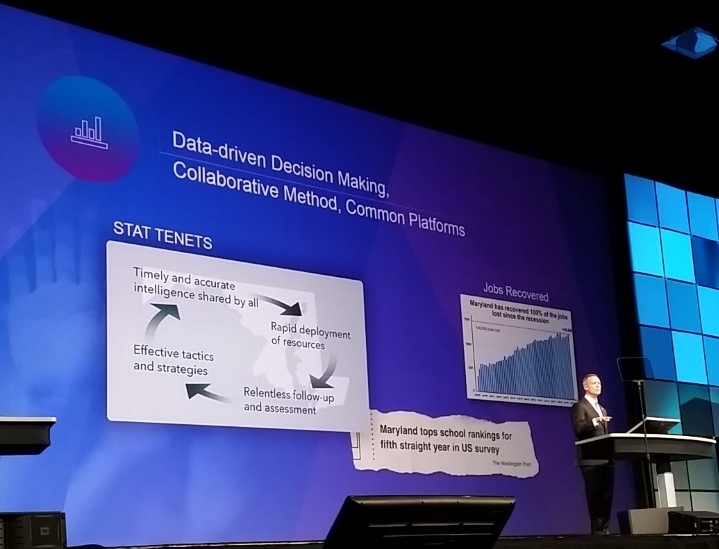 ESRI and Jack Dangermond masterfully leveraged their software; their ideals have driven the geospatial industry. The geospatial industry was founded upon Roger Tomlinson’s and Jack Dangermond’s perseverance and intellect. They are the geospatial equivalent of Steve Jobs and Steve Wozniak. Complaints and whines about new functionality, new extensions, new enhancements, and new products will persist into perpetuity. Why? Well, first and foremost, software must evolve and no form of evolution is ever perfect. Secondly, each new, bright-eyed and bushy-tailed GIS generation will have the same complaints as those of us did in 1990s, in the 2000s, and in the 2010s. That is Life, folks. Haters make statements like, “QGIS is better,” or “GRASS is better.” Forget for a moment no formal support exists for either. Sure, forums exist on the Internet. People can post questions, perhaps get an answer. But, no formal support. No formal upgrade or update schedule, usually, for open source software. In fact, many of these products are in perpetual “beta,” only a current “build.” Neither is open source immune from bugs, fixes, upgrades, updates, and enhancements. Even today, a new update for QGIS was made available. Also, people seem to forget how complicated and inter-related software can be. How many times have we seen a Windows Update break some other non-Windows application? How many times have we seen something as mundane as a printer driver break an application? Remember the days when Arcinfo, ERDAS Imagine, and Adobe Acrobat Reader had to be installed in the correct order, otherwise none of the software would work? Years ago, I learned ArcGIS represented the largest collection of .NET objects outside of any Microsoft product. That is not of little consequence. A computer hard drive becomes like a person’s bowels. Code for each bit of software is like a unique bit of bacteria, some bacteria is beneficial to other code-bacteria, some bacteria is detrimental to other code-bacteria. And, let’s just hold talk of viruses for another occasion. A hard drive is code-based ecosystem and pulling out bits of code, making sure they all play nice, making sure one code bit is not toxic to another code bit, well, hell, we don’t even know how our own bacterial flora operate really. And, ESRI is supposed to have perfect knowledge of Oracle, of Microsoft, of IBM, of Intel, of AMD, of whatever? OK. Sure. Right on. No such thing. Kurt Gödels Incompleteness Theorem sort of addresses the notion of perfect knowledge. What all of this boils down to really is either a fundamental willful blindness of how software is designed, developed, and engineered, or just being naive about the larger development ecosystem. Commercial software has benefits; open source software has benefits. But, each have their own unique collection of costs and drawbacks. I use open source software all the time, as well. I use QGIS and GRASS at home, GIMP, Blender. They are nice, and I have no problems using or promoting open source software. I promote them to faculty, staff, and students, and anyone curious about mapping. Whatever can help a person solve or address a curiosity or project. Yes, I don’t like ESRI’s interpretation of JSON; however JSON is a framework able to be adapted by anyone. Sometimes, I have to use QGIS to handle JSON files. But, comments about ESRI’s general approach to software development are simply preposterous, really. The afternoon showcased three massively brilliant efforts fantastically presented by supremely capable people. We learned about the infestation of red mangroves along coastal Hawai’i (link) by sisters Sarah and Lily Jenkins. Both Sarah and Lily won at the 2015 Intel Science and Engineering Fair, and Sarah turned down a full scholarship at Harvard to attend Duke. 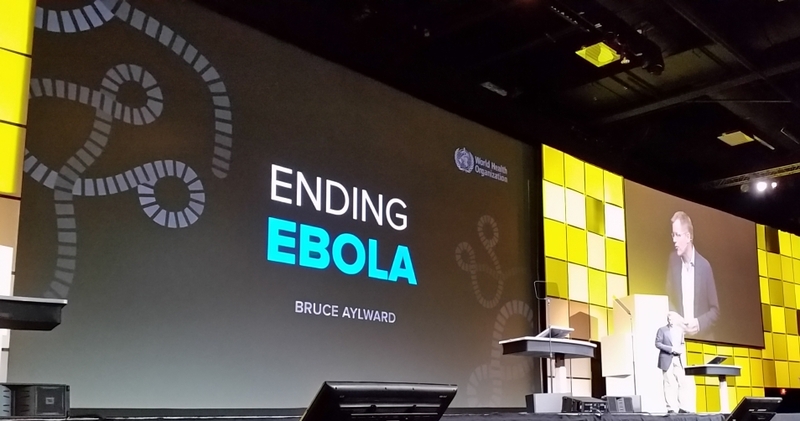 Dr. Bruce Aylward debriefed the audience on his work to eradicate ebola in western Africa. Ebola, as we learned Fall 2014, is a horrible, deadly, unforgiving illness with a 90% fatality rate. Ebola infects a host human, typically first through an infected animal, such as a bat. Some people in western Africa eat bats, a source of protein. The person is then infected, passes the infection on to someone else, and within 4 to 6 weeks an epidemic has begun. Ebola passes readily in west Africa for a variety of reasons. People do not trust foreigners, humanitarians, doctors, or any medical personnel. When people get sick, they hide or keep to themselves. As the virus kills, the bodies must be cremated to absolutely kill the virus; families see cremation as a desecration and hide the body of the deceased. People afraid they are carrying the virus do not seek out help for fear of being quarantined. Villages are remote and lack proximity to a health facility even if people want assistance. Roads are poor, at best, and during the monsoon season are non-existent. Thus, as Dr. Aylward points out, while ebola has been marginalized full eradication is presenting extreme challenges. Gary Knell, CEO of National Geographic Society, discuss two topics. Paul Salopek is crowdfunding his walk around the world. He isn’t walking for fun and pleasure, a side benefit, maybe. No, his real purpose is to follow the steps of Humankind’s migration from near the Horn of Africa, and end somewhere near Tierra del Fuego, in Argentina. People can track Paul using #edenwalk and @outofeden on Twitter. Gary Knell also set forth details on National Geographic’s emphasis on developing a “geographically competent America.” Knell stated, “We have students, people, who can’t find Japan on a map, who don’t know where Japan is, who don’t know where important countries are. To have an effective democracy who are in touch with world events and circumstances, we need people who are geographically competent, Knell declared. 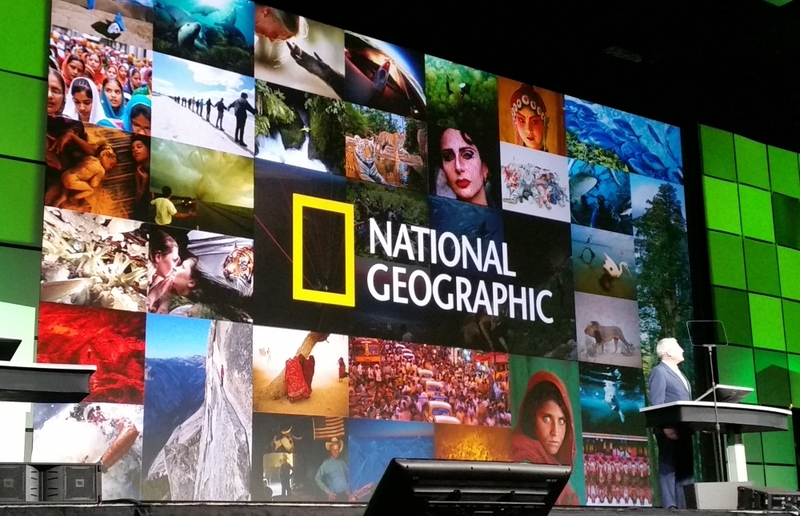 NatGeo has instantiated grant programs for organizations, have developed videos and video programs viewed by well over 700 million people globally, and are working with organizations and educators around the country to assist in helping students become more geographically competent. Many videos were shown. The opening video channeled everyone’s inner Sagan, a perspective not from Earth, but of intergalactic space, zooming in at warp speeds to ground-level Earth in the spirit of Neil de Grasse Tyson’s Cosmos, and Sagan’s Cosmos. Really beautiful video on a huge screen. Each presentation ran the gamut from “Cool” to “OMG That Was Awesome.” Jeremy Weber, who I thought was going to speak from a podium, was actually part of a large ESRI-flavored “America’s Got Talent” skit to showcase many of ESRI’s new apps developed both in-house and by 3rd party software vendors, like Geo-Jobe. The Monday morning plenary had the desired effect on me, and I think on those in my immediate surroundings. I know I overheard people whispering, “I’m so glad I come to this. After a year of fighting battles, of pushing people, of being pushed by people, of figuring out a way to make things work, I need this enthusiastic crowd and Jack’s motivation to let me know all of my effort is worthwhile.” ESRI helps bring people together, but the momentum to drive forward comes from the crowd, comes from the people working in public works in Ireland, managing Abu Dhabi in the United Arab Emirates, the teachers coaching middle school kids in Louisville, the doctor fighting ebola in Sierra Leone.